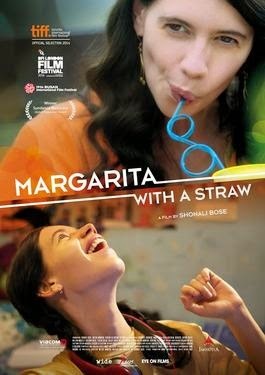 Margarita With A Straw, previously known as Choone Chali Aasman in the Indian market & Margarita With A Straw in the International market is a 2015 Indian film directed by Shonali Bose, starring Kalki Koechlin. The disease the main character having is Cerebral palsy. Cerebral palsy (CP) is a group of permanent movement disorders that appear in early childhood. Signs and symptoms vary between people. Often problems include: poor coordination, stiff muscles, weak muscles, trouble swallowing or speaking, andtremors among others. There may also be problems with sensation, vision, and hearing. Often babies with CP do not roll over, sit, crawl, or walk as early as other children their age. Difficulty with the ability to think or reason and seizures each occurs in about one third of cases. While the symptoms may get more noticeable over the first few years of life, the underlying problems do not worsen over time. Cerebral palsy is caused by abnormal development or damage to the parts of the brain that control movement, balance, and posture. Most often the problems occur during pregnancy; however, they may also occur during childbirth, or shortly after birth. Often the cause is unknown. Risk factors include premature birth, being a twin, certain infections during pregnancy such astoxoplasmosis or rubella, exposure to methyl mercury during pregnancy, and head trauma during the first few years of life, among others. About 2% of cases are believed to be due to an inherited genetic cause. A number of sub-types are classified based on the specific problems present. For example those with stiff muscles have spastic cerebral palsy, those with poor coordination haveataxic cerebral palsy, and those with writhing movements have athetoid cerebral palsy. Diagnosis is based on the child's development over time. Blood tests and medical imaging may be used to rule out other possible causes.